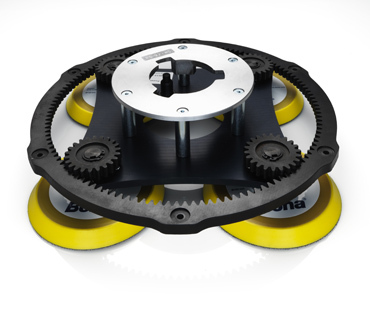 This latest version is called the 'Bona Flexisand 1.5 Power Drive Pro System' and comes with a powerful 1500w motor driving the geared 'Power Drive' system. The Tabs below contain the operational information of our evaluations through the testing we have done over several days with the Bona Flexisand 1.5 Power Drive Pro System sander, click through the tabs to find the relevant information. "The next generation in the Bona FlexiSand Pro System is here. The all-new Bona FlexiSand 1.5 revolutionises bare wood sanding. Geared for the unique 'Bona Power Drive' it is the first direction-free sanding machine that can sand down to bare wood. It operates in all directions, allowing you to complete every sanding task with ease and comfort". The above text is the Bona marketing information from their website. The demonstration machine we were given was delivered to us with only about 16 hours usage on its digital hour meter, and came set up with the very robustly engineered 4 head quattro geared power drive plate. We have been putting this machine through it's paces for several days now and have coincided this review to be published at about the same time as Bona officially announce the release of the newest version of the Bona FlexiSand 1.5 Power Drive Pro System. 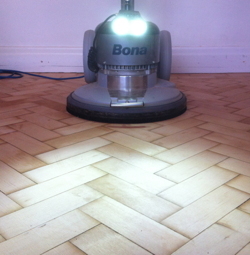 We have thoroughly enjoyed the testing with the Bona FlexiSand Power Drive, and have tried to put the machine through it's paces with everything a professional floor sander comes up against on a day to day basis when sanding and refinishing wooden floors. In my humble opinion the machine Bona have produced, truly is a stunning piece of wood floor sanding kit and has dealt easily with the many different floor types encountered during the trial, leaving every wood floor we have restored with it looking quite literally as good as new. The machine is undoubted quality, very well engineered, robust and deceptively easy to use. 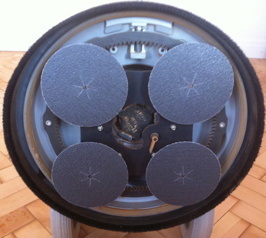 This is a geared drive plate driven machine, unlike the previous model - but the smooth power delivery along with being completely multi - directional in it's movements and application, plus the high build quality only benefits the overall performance of the Bona Flexisand Power Drive wood floor sander. The quick and easily interchangeable disk system is another considerable operational bonus. The self adjusting dust protection skirt around the base of the machine really does work wonders and helps considerably in assisting the excellent dust extraction through the machine. We use the powerful Bona DCS 70 dust extraction unit in conjunction with the Flexisand. The powerful single speed [147 rpm] 1500 watt motor [230v @ 50-60 Hz] really is a revelation, reasonably quiet, smooth and under statedly powerful. This machine puts its power down exactly where its wanted...on the sanding heads doing it's business with the wooden floors powerfully and efficiently. The handling of this machine we have found to be quite exceptional, upon starting, the machine doesn't jolt, lurch or move unexpectedly, instead just sits effortlessly spinning away awaiting direction from the operator. That said the Flexisand Power Drive is over 10kg [22 lbs] heavier than the Bona Buffer so the Handling characteristics are going to differ, this new machine is also direct gear driven so the handling of the machine was always going to be different. But don't think for a moment that this machine is difficult to handle, quite the opposite it has to be said, with this machine having a considerably wider handle than previous models which we've found gives much better leverage when moving this machine in the desired direction. 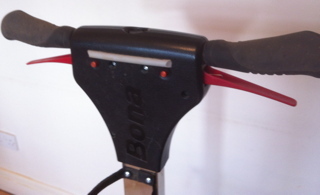 We found that the Bona Flexisand Power Drive seems to move easiest being pushed forwards and pulled backwards, but does move very nicely in any direction the operator needs the machine to operate. Most importantly, whatever direction the machine moves it removes sanding marks with ease, and when the correct grit level sequences are followed, the end user will be left with a beautifully smooth and properly prepared wood floor surface. 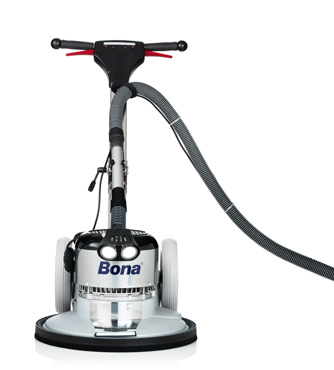 We have found the Bona Flexisand 1.5 Power Drive floor sander easy to use and operate whether the area we were working on was a small or large room. This Bona Flexisand Power Drive comes without an additional weight, but does come with a set of rather fabulous headlights mounted on top of the motor, these lights i believe will be an optional extra !! On either floorboards or parquet floors the machine starts and stops quickly and easily, to start the machine firstly just press either one of the 2 small red buttons on the front of the handle, then lift up either one of the 2 red handles and the machine will start, to stop the machine simply let go of the red handle and the machine will instantly stop. For the duration of our testing with this machine, we have used mainly standard Silica Carbide 6" Velcro backed sanding discs, occasionally interspersed with Aluminium Oxide discs to see if the change in the abrasive quality made a difference to the longevity of a set of 4 sanding discs. A set of four Silica Carbide 6" [150mm] P50 discs did stay sharp and remove sanding marks for a lot longer than I would expect them to last on the Bona Buffer for example, they were good for well over 40m2 [on the Flexisand Pro] being used on both Beech Parquet Blocks, and Mahogany Mosaic panels. We were also asked to test the new generation of Bona's ceramic abrasives, which we duly did on 3/12/2012 using them on a Columbian Pine parquet wood block floor. We then we put 4 x P50 grit ceramic discs on the Flexisand Pro System to evaluate for ourselves the performance levels between ceramic discs and the standard Silica Carbide ones. It was evident pretty quickly that the ceramic discs we were using were effortlessly removing any sanding marks that had been left in the parquet flooring by our Bona 10" Belt Sander. After the area was properly sanded off with the P50 Ceramic discs the surface of the parquet was now fairly smooth it has to be said, and after having a close inspection of the floor, there was barely a mark or blemish of any note left on the surface of this parquet block floor !! After we had inspected the full condition of the floor after using the P50 ceramic discs on the Flexisand Power Drive, one of my colleagues blended out the very few sanding marks we had found left in the floor, using the rather splendid Metabo SXE 450 orbital sander that we use for exactly this situation. After those few marks were removed, we then attached [to the Flexisand Pro] a set of 4 x 6" [150mm] Aluminium Oxide discs, these were P60, we then went over the the whole floor again, the room in this case being only 14m2, the Columbian Pine parquet block floor was genuinely beautifully smooth and there was still one more course of sanding left to go !! Next was a set [of 4] 6" [150mm] Aluminium Oxide P100 discs for the Flexisand Power Drive, we steadily went over the floor in the room again, leaving a quite stunningly smooth surface for us to apply the lacquer system to this floor. The floor surface we were left with really was beautifully glass smooth, when thoroughly vacuumed and tack clothed the floor surface felt better again. Having used a 4 head attachment before on the Bona Buffer we use on a day to day basis, I was intrigued to see first hand the difference between the new geared 4 head multidisc and the older version. The new drive plate is a very robustly built and well engineered piece of kit, it fits snugly into position with very little free movement. For the uninitiated the 4 head geared drive plate consists of 4 x 6" Velcro backed drive heads giving it 24 square inches of direct driven abrasive cutting and wood floor sanding power. We used this set up on the particular floor we were working on straight after we took this picture, it worked superbly making light work of smoothing off and removing virtually all the sanding marks that were left in the floor from the previous sanding application. The dust extraction through this machine we found to be very good indeed, for our testing we used a Nilfisk dust extractor with the hose connected directly into the Bona Flexisand Power Drive dust extraction hose. Unfortunately, at the time of the testing we didn't have a Bona DCS 70, so we used one of our powerful Nilfisk Aero 25/21 vacuums and i have to say the results were extremely pleasing. We now have a DCS 70 dust extraction unit and the results when attached to the Flexisand are extremely impressive, a big improvement over a smaller vacuum, the suction of the DCS 70 removes virtually every spec of dust created during sanding operations with the Flexisand. With the Bona DCS 70 connected to the Flexisand, the very powerful suction removes virtually all the dust and debris from the abrasives attached to the sanding heads, which in turn seems to make the sanding abrasives stay sharp and last even longer than they were previously. Even when using a quite harsh abrasive eg. Ceramic P50 grit, the dust pickup is virtually total, barely a spec of dust is left on the floor surface - very impressive !! It's the same story with the finer grit levels such as P80, P100 and P120, with there barely being any residual dust of note left on the floor surface, when the Flexisand is attached to the DCS 70. For some months now we have heard whispers that the Bona Flexisand 1.5 Power Drive sanding machine can in fact sand off a fairly flat Engineered wood floor back to bare wood WITHOUT having to first use a main Belt sander first !! I must say that I found this assumption to be a little far fetched and have been looking forward to be able to try out the Flexisand Power Drive on a suitable project to see if what I had heard is actually correct ! Well thankfully a project came up where we could see if the whispers are fact or fairy tale. The engineered oak floor we sanded was in an upstairs hallway and was almost pan flat, with the area being 15m2 in total, we put new P36 grit ceramic discs on the Flexisand Power Drive plate, attached the machine to our dust extraction unit and away we went. It took around 45 minutes to steadily work through the area with the P36 grit ceramic discs as the area was relatively small, with a lot of 'stop - starting' to contend with, but we could not have been any more pleased with the outcome or the outstanding performance of this machine on this type of floor surface. After the Edging and corner sanding had been completed we then worked our way through the grit levels finishing on P120 grit to leave a beautifully smooth finish to this Engineered Oak Floor. 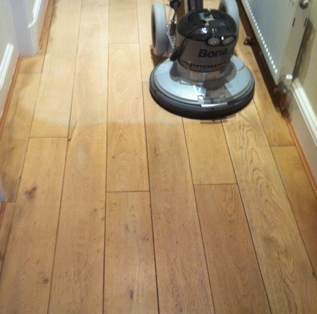 I must also comment that this type of sanding a wooden floor, is in my opinion the exception rather than the rule...The best way to properly clean off the top surface of a wood floor is to use a proper heavy duty floor sanding machine such as the excellent Bona 10" Belt Sander or equivalent. If photographic proof isn't enough :-) we also took a video clip of the machine doing its business on the Engineered Oak Floor. Moving the Bona Flexisand 1.5 Power Drive sanding machine between the back of the van and the job site [and back again] really is simple. This machine has been designed with much bigger [and softer] wheels than previous versions and it certainly makes machine moments such as moving the Flexisand Power drive down long or uneven paths or driveways or moving the machine up and down steps into properties and over door thresholds much easier than before. The machine weighs in at a not exactly lightweight 45 kg [99.0 lbs] but the lifting of the Bona Flexisand Power Drive Pro System has been made easier with having sturdy front and rear carrying handles, the two handles help to make both a single and two person lift of this machine pretty simple. Note the 'T' pull out lifting handle on the front edge of the machine, cleverly designed to allow 2 handed lifting, making the lift easier and most importantly safer !! A fold down step less, easily adjustable handle makes the storage and transportation of the machine really straightforward. The above picture shows the machine with the handle folded down, note the forward and rear carrying handles. The above video clip shows the Bona Flexisand Power Drive being easily removed from a property, over a door threshold and down two steps, the large soft oversized looking wheels are certainly a big help. We really do like this innovation as the bright lighting certainly does highlight any sanding marks which are left in the floor, which without the lighting the end user may inadvertently miss and leave unsightly marks in the floor surface. The lights also show up any dust and debris left on the floor surface. So if you know where they are [the sanding marks] you can easily go back over the said marks to remove them from the floor surface, thus helping to leave the end user with a high quality, blemish free and smoothly finished floor. On one of our recent floor sanding projects, which unfortunately had quite poor lighting in two rooms, the light on the Bona Flexisand Power Drive was invaluable in that the extra illumination from the lights on this machine really did help us to see [then remove] some sanding marks which were inadvertently left in that particular floor surface. In summation we have only positive things to say about the Bona Flexisand 1.5 Power Drive Pro System floor sanding machine, we've tried hard to find faults, niggles and perhaps things that could have been done a little better with this machine, but we are really struggling to find anything worthy of comment in that regard. I must be honest and mention that it has taken us a little time to get fully in sync with how the Bona Flexisand Power Drive sanding machine does its business, but I have to say that this machine is extremely impressive in the way it removes the sanding marks from the surface of the wooden floors we have sanded with it. The sanding marks were removed from the floors very nicely indeed with standard P50 Silica Carbide sanding discs - but when Ceramic discs are put on, this machine quite literally goes into overdrive and removes marks and blemishes pretty swiftly with considerable ease. I did think the Ceramic discs would themselves leave unsightly scratches in the floor surface...but that wasn't the case at all, it was very much the opposite in that even after the wood floor had been sanded with P50 grit Ceramic discs, the surface was left with the floor feeling quite smooth and virtually blemish free. We did think that putting P60 Aluminium Oxide sanding discs on the machine [straight after the ceramic P50's] may not remove the sanding marks, but thankfully we were very much mistaken. Remove the marks they did !! and left the floor surface very smooth indeed, after the last sanding course was completed [with a P100 grit] all the floors we have completed with the Bona Flexisand Power Drive were quite literally glass smooth and mark and blemish free. This floor sanding machine machine is easy to handle both from a working floor sanding perspective and also a movement/transportation one, the big soft wheels make moving the Bona Flexisand Power Drive from the van to workplace, even down long and bumpy paths and entrances really quite easy. The 'headlights' which came with the demonstration machine we used, were I have to say just superb and are unquestionably a considerable plus point in the overall operational performance of this floor sanding machine. As a professional floor sanding company, we do like to have all the best tools and equipment for the job in hand to get our clients wood flooring in as good a condition as possible before we apply the lacquers or Oil finish to complete their project, this machine helps considerably in that regard. This machine really does tick ALL the right boxes for this type of wood floor sanding machine, easy to use, loads of power, extra features which overall combine together superbly well to produce fantastic results...what's not to like !! There are many more things this machine can do that we unfortunately didn't have time to test before Bona quite rudely took their machine back ;-) such as using the other types of interchangeable discs which perform different tasks, such as the "Diamond Disc" which is used to smooth off concrete surfaces and screeds. We have now ordered a new machine from Bona, which just may be the first to arrive in the UK !! We were delighted to take delivery of our brand new machine, which was the first Flexisand Power Drive ProSystem 1.5 to be delivered to any contractor in the UK 9-1-2013. UPDATE ! !...Since taking delivery of our new Bona Flexisand Pro System and using the machine daily on our projects, I can happily report that the machine performs even better than the prototype machine which we tested for Bona !! I am very reliably informed that this slight performance improvement is down to the fact that the production machines have a more robust, upgraded and slightly heavier motor than the prototype we tested...BONUS !! 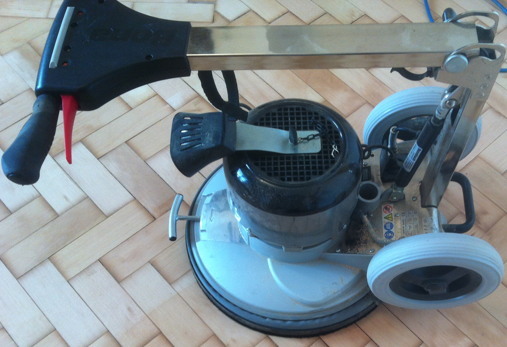 Thanks for reading - Hope you have enjoyed this genuinely honest and impartial review, of, a genuinely great floor sanding machine. [Northern England & North Wales] for his considerable help and valued assistance on this project...Many Thanks Fred. REMEMBER - ALWAYS follow the manufacturers instructions and read them carefully. If you are not sure about any aspect of this article consult a Professional.